A train is a form of rail transport consisting of a series of vehicles propelled along a rail track to transport cargo or passengers. Most children love trains. They are fascinated by big, load and powerful things. If you are looking for project ideas on how to entertain your kids on a rainy afternoon, then making trains at home is the best and fun way to go. Your children can make a train from candy, its fun and kids can eat candy while they make it. They can also make a train from paper or an egg carton. You can also make a train from juice boxes too! An entire traveling circus, carnival or zoo can be made if you have enough of these cages for all the animals. Remove the sliding drawer from a matchbox and throw away the matches as you will not need them. You may also discard the matchbox cover. Paint the matchbox drawer inside and out, and allow it to dry thoroughly. Glue a row of toothpicks inside the box on all 4 sides to make the bars of the cage. Cut out 4 tiny circles of thin cardboard for the wheels and paint them a bright color. Allow them to dry. Attach the wheels to the cage with straight pins. Push the pins through the center of the wheels and bend the pins inside the box so that the wheels won't slip off. Place a tiny toy animal in the cage. Cut a piece of white paper a little larger than the cage for an awning. Make stripes on the awning with paints or crayons. Place the awning over the toothpick bars, forcing the tips of the toothpicks through the paper. Add 2 toothpick handles and the cage is ready to roll. Remove the covers from 3 or 4 shoe boxes. Punch a hole near the bottom of each of the box ends. Obtain a length of cord or string that is long enough to pass through the insides of the boxes and to provide a length for pulling the train. Then tie a clothespin on one end of the cord. Beginning on the outside of one box, run the cord through the hole so that it comes through into the inside of the box. The clothespin will prevent the cord from slipping out of the end of the box. 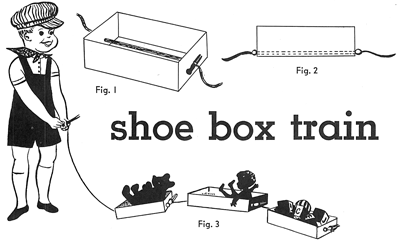 Pull the cord along the bottom of the box and out the other end of the box, as seen in figure 1. Knot a second clothespin on the outside of this end of the box, as seen in figure 2. Then run the cord through the other boxes in the same way, as seen in figure 3. Be sure to knot a clothespin at the other end of the rope. This will make a handle. The shoe box train is now ready to be loaded with toys and pulled across the room by a toddler. Find a bunch of big cardboard boxes. You can create your own cardboard trains or look at the picture above to help guide you towards creating a ride-on train. Use paper plates for wheels...glue them on the boxes. The first box isn't a sit-in box, it is just the front of the train. Make it face down and bring the side flap up and cut a window out of it. Attach a steering wheel paper plate to the box with glue or a brass paper fastener. The 2nd box car should have a rectangle portion cut out of it...this is the car that you can sit in. The remaining cars in the back could be whatever you want...but should be open at the top so that people or toys can sit in there. You can glue the boxes together or attach them with poked holes then strung with string and knotted together. It is all up to you and your creativity...have a train-ful of fun! Use box-tops for the bases of all the cars for this train, and milk bottle tops or button moulds for their wheels. Attach the wheels to the bases with two-pronged paper fasteners. Fasten loosely enough to allow the wheels to turn easily. To make the tops of the cars use smaller boxes than those used to make the bases. Use an oatmeal box for the top part of the engine. Glue in place. Cut little slits in the box for the stacks and bell. 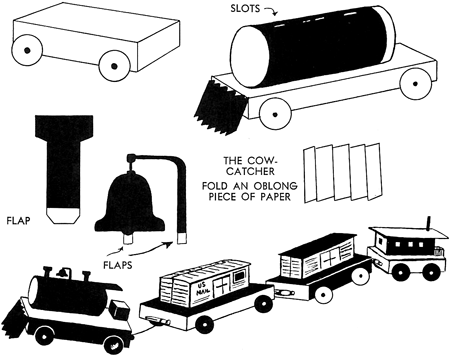 Make the bell and stacks from black construction paper. Decorate each car according to its use. Obtain a piece of paper. 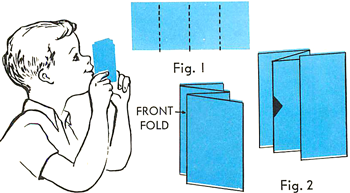 Fold it into 4 parts, as pictured in Figure 1. Cut a hole in center fold, as seen in Figure 2. Then hold the front fold against your lips and blow into it. You will be delighted with the first class whistle you have made for your train. Advent Choo Choo Train Craft for Kids - Countdown to Christmas in a different way this year with an Advert Choo Choo Train. All Aboard Choo Choo Train Arts & Crafts Project - Encourage your children to use their imagination to create their own choo choo train using crayola products and materials around the house. All Aboard for these Preschool Train Crafts! - These are simple and fun crafts for the young preschoolers to enjoy. Amigurumi - Sushi Train Toy to Make - This train craft is for the older children and adults who can crochet. Animal Cracker Circus Trains Craft for Preschoolers & Toddlers - Make a cool circus train for your animal crackers. Animal Train Arts Activity for Youngsters - Your children will have tons of fun making and coloring their own animal train. Build Your Own Train: Steam Engine - Print and follow the instructions to build a steam engine plane. Choo-Choo Train Growth Chart - Learn how to make a colorful choo-choo train growth chart by following these instructions. Christmas Train Paper Craft - Print the template and follow the instructions to put together a paper Christmas train. Chugga-chugga Choo choo! Train Craft - Your kids can create a train using constructions paper, scissors, tape, glue cotton balls and other materials. Cork Trains Craft for Children - Make a train out of wine corks! GG1-type Electric Locomotive - Print the GG1-type Electric Locomotive train template and follow the instructions. Here Comes a Train! - Have your kids use their imagination with the help of Crayola products to design their own train. How to Make a Cardboard Box Train - Find out how you can make a train out 5 show boxes, 3 large paper clips, toilet paper tube and other basic materials. How to Make a Paper Train- Learn how you can make a paper train by following these instructions. How to Make a Train Pinata - Make a very cool train piñata for your train themed birthday party. How to Make a Train Using Paper - All children love to make a train out of paper! Follow these instructions to make your own. How to Make a Train With Egg Cartons - Learn how to make a train using an egg carton, paint, paper and other materials by following these instructions. How to Make Kids Candy Train Party Favor Craft - Make a cool edible train with your children. This is also a great birthday party craft. Japan Railway E1 Max Bullet Train PaperCraft Model - Print the template of the Japan Railway E1 Max Bullet Train and follow the instructions to put it together. Juice Box Train - Your children can reuse their juice boxes to make a cute recycled train. Love Train - This Valentine's Day make someone special a sweet love train. Ni Hao, Kai-lan Tissue Box Train - Make a cool tissue box train with your friends Ni Hao and Kai-lan. Recycled Train Craft - Make a train from recycle items such as a tin can and some Snapple tea lids for the wheels. Steam Train - Make yourself the driver of a steam train..
Super express train - Print out the pattern of this Super Express Train and have your kids put it together. Thomas the Tank Engine Paper Craft- - Follow this simple craft and make your own Thomas the tank engine train. Tin Can Train - Use different size and shape tin cans and other recycled materials to make a train at home with your kids. Toddler Train Craft - Help your toddler make their own train with simple materials such as construction paper, cereal boxes and crayons. Train Across Canada - Enjoy the scenery of Canada with this cool train craft. Train Beaded Safety Pin Design - Make a beaded safety pin train design by following the giving pattern and instructions. Train Costume - Find out how you can make a Halloween train costume with your children. Train Crafts for Older Kids - This website will show you different train crafts for older children they can do at home. Train Models - Learn how to make model trains using the available free pattern. Train Ornaments - Make a train ornament for your Christmas tree that you and your kids will cherish. Train Pattern for Beaded Saftey Pin - Use the free train pattern given to make a beaded safety pin jewelry. Train Passenger Car Paper Craft - Print the train passenger car on paper and follow the instructions carefully. Trains - Encourage your children to use their imagination to design their own paper train. Train Wind Chimes - Turn a wooden train kit into the most beautiful train wind chimes.